Open Archives Initiative Object Reuse and Exchange (OAI-ORE) defines standards for the description and exchange of aggregations of Web resources. This document provides a brief overview of the abstract data model underlying these standards, serializations, implementation with HTTP, and discovery. This user guide is one of several documents comprising the OAI-ORE specification and user guide. It is intended as the place to start for first time readers. The ORE Model makes it possible to associate identities with aggregations of web resources and to describe their structure and semantics. It does this by introducing the Resource Map (ReM), which is a network accessible resource that encapsulates a set of RDF statements. These statements describe an Aggregation as a resource with a URI, enumerate the constituents of the Aggregation, and the relationships among those constituents. This primer first introduces the technology Foundations of the ORE specifications. It then summarizes the Data Model and Serialization formats. Issues with HTTP implementation and the Discovery of Resource Maps on the Web are outlined and, finally, Trust and Authority are very briefly discussed. Throughout this document there are links to more detailed expositions in other ORE User Guide and Specification documents. OAI-ORE and OAI-PMH [OAI-PMH] are separate standards; OAI-ORE does neither extends nor replaces OAI-PMH. OAI-PMH is a protocol and an XML message format for the exchange of XML records (typically metadata). It supports selective or incremental harvesting which allows a client repository to maintain an up-to-date copy of records in all or part of a source repository. ORE defines a data model for Resource Maps that describe aggregations of web resources, and recommends serialization formats for these Resource Maps. ORE is based on the Web Architecture where every information object is made available via a URI. No new protocol is defined. Exchange of Resource Maps is possible individually by direct web access, and via batch discovery mechanisms. OAI-PMH is one protocol that may be used to implement batch discovery. Resource - an item of interest. URI - a uniform global identifier for a resource [RFC3986]. This document specializes this with the notion of a Protocol-Based URI, which is a URI that can be de-referenced via a common protocol to provide access to a representation. The most common protocol in the current implementation of the Web is HTTP [RFC2616]. Representation - a data stream corresponding to the state of a resource at the time of a dereference of its protocol-based URI. The Web Architecture allows for multiple representations of a resource with access mediated by Content Negotiation. Link - a directed connection between two resources. In HTML a link is expressed via link or anchor tags (a hyperlink) in a representation of the originating resource to the URI of another resource. 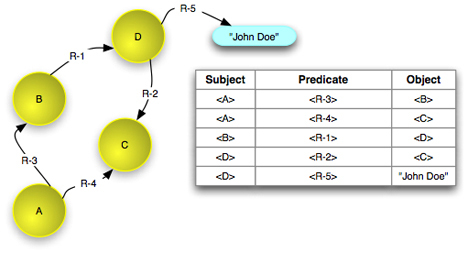 The Semantic Web extends links to typed relationships, which are explained below. The combination of these concepts forms what is commonly referred to as the Web Graph, with nodes that are URIs (which identify resources), from which representations are made available, and edges that are links or typed relationships. An example of a Web Graph is shown in figure 1 below. 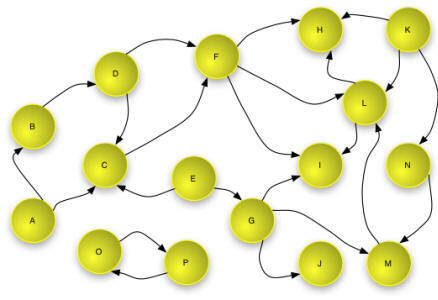 Note that this example shows that the Web Graph is not necessarily connected - nodes O and P link to each other but not to other nodes in the graph. The ORE specifications also leverage Semantic Web concepts from RDF [RDF Concepts]. In RDF, the relationships between resources are described using sets of triples, each made up of three parts: a subject, a predicate and an object. Each triple states that a relationship of the type indicated by the predicate (a URI) holds between the resource identified by the subject (a URI) and the object (a URI or a literal). The subject is a URI that identifies the described resource; the object is either the URI of a second resource or a literal that identifies values such as numbers and dates by means of a lexical representation; and the predicate is a URI that identifies a type of relationship. A set of RDF triples is referred to as an RDF Graph because it can be represented as a node and directed-edge diagram, in which each triple is represented as a node-edge-node link. The nodes of an RDF Graph are the subjects and objects of the constituent triples. In an RDF Graph each node is connected to at least one other node in the graph. The description above is a slight simplification of the RDF model because it ignores the concept of blank nodes (sometimes called bnodes). Blank nodes are nodes that do not have a URI or a literal value yet may be the subject or object of triples. Their representation depends on description syntax. In the ORE model, blank nodes may be present in the description of author and contributor information. They are not described further in this primer and it is recommended that they be avoided through the use of URIs to identify authors and contributors wherever possible. An example of an RDF Graph is shown in figure 2 below. The subject and predicate of a triple are always URIs (URIs are indicated by the text in the yellow circle and shown with bracketed syntax <A> in the table) and the object may be a URI or a literal (shown as a blue rounded rectangle in the graph and in quotations in the table). The RDF relationship rdf:type [RDFS] makes it possible to express types for resources. Figure 3 below shows an example of this. The objects of the triples with rdf:type predicates are URIs, that denote classes or types. The ORE specifications build on the notion of a Named Graph [Named Graph], which extends RDF to allow the association of a URI (a name) with a set of triples (an RDF graph). The Named Graph is a resource, identified by a URI. That URI can be the subject or object of triples. These triples can, for example, express a type for the Named Graph, or associate metadata properties (e.g. dcterms:creator) with the Named Graph. A Named Graph is NOT the RDF Graph itself. Instead it is a resource with a representation that encodes the set of triples that form the graph. The semantics are similar to RDF reification [RDF Semantics], in the manner that they allow the assertion of relationships between other resources and the set of triples. This provides the basis for signing, authority, and trust. This is relevant in this specification where Named Graphs are being used to provide descriptions of citable intellectual objects. The ORE Model uses predicates from a number of vocabularies, including one specific to ORE, which are described in the ORE Vocabulary specification. The following namespace prefixes are used in these specifications. An Aggregation is a set of resources, and the resources in an Aggregation are called Aggregated Resources. An Aggregation does not have a representation (it is a non-information resource [HTTP Range]). However, it is made concrete through description by one or more Resource Maps. In order to be able to talk about the Aggregation on the web, it must have a URI (say A-1). So that applications and clients can reference the Aggregation in an actionable fashion, the Aggregation URI A-1 must yield or lead to a Resource Map when dereferenced. Methods by which that may be achieved are described in the HTTP implementation section. A Resource Map is named graph identified by a protocol-based URI (say ReM-1). It is an information resource from which a representation is available when the URI ReM-1 is dereferenced. The ORE Model requires that a Resource Map describe just one Aggregation. There may be multiple Resource Maps in different formats that describe the same Aggregation. Figure 4 shows a complete Resource Map with statements indicated as arrows from subject resource to an object resource or literal. The predicates are shown as labels on the arrows. The remainder of this section explains the components of this Resource Map step-by-step. If a Resource Map is identified by an HTTP URI ReM-1 then an HTTP GET on ReM-1 must yield a serialization of the Resource Map. Note also that ReM-1 appears as a node in the graph and is the subject of several triples highlighted in the figure 5 below. There are two items of essential metadata associated with the Resource Map. The dcterms:creator predicate indicates the creation or generation authority responsible for the Resource Map (shown as URI X), and the dcterms:modified predicate indicated the last modification or update time of the Resource Map (a literal indicated by the blue rounded rectangle, say 2008-05-01T12:34:56Z). The last predicate highlighted, ore:describes, is the link to the Aggregation that this Resource Map describes (shown as A-1). Figure 6 highlights the aggregation graph, the combination of the Aggregation node (A-1) and all of the Aggregated Resources (AR-1, AR-2, AR-3) linked with ore:aggregates predicates. Note that there is no ordering, the Aggregation is just a set of Aggregated Resources. Order could be added with other predicates but is not included in this Resource Map. If the Aggregation denotes a resource that has other identifiers then the other identifiers are expressed using the ore:similarTo predicate. Figure 7 below shows a second identifier which is a DOI (labeled DOI-1). It also shows typing of the aggregation with the predicate rdf:type and type resource T-1 (indicating the semantic type ore:Aggregation). Finally for this simple example, figure 8 below shows that there may be relationships involving the Aggregated Resources. Perhaps from AR-1 predicate R-1 indicates dcterms:hasFormat to a substantially similar resource in another format C, and AR-3 has rdf:type T-2 (say foaf:Image). In practice most Resource Maps will be rather more complex. There may be additional Metadata about the Resource Map and Aggregation [Data Model] such as a creation date and rights information for the Resource Map, or authorship information for the Aggregation. There may be additional Relationships between the Aggregation and Similar Resources where care must be taken to choose a predicate with the appropriate semantics: rdfs:seeAlso expressing a rather weaker similarity than ore:similarTo. There may be additional Relationships to other Resources and Types such as type information or relations to any other resource. To enable reuse is key goal of the ORE effort. To this end, the RDF Graph of a Resource Map - Advanced section of [Data Model] describes the use of Aggregated Resources while asserting that they are a constituent in another Aggregation, the nesting of Aggregations, and reference to Aggregated Resources via Proxies that "stand for" an Aggregated Resource in the context of an Aggregation. The use of Proxies is an optional but powerful mechanism that provides a means to reference in context and to make assertions that have meaning local to an Aggregation (but can still be combined with other global statements without creating contradictions). When reusing Resource Maps and the Aggregations that they describe, it is important to remember the distinction between these two entities. Statements about ReM-1 are statements about the Resource Map and not the Aggregation; statements about A-1 are statements about the non-information resource that is the Aggregation. The simplest serialization format is the Atom Syndication Format, and this is likely to be appropriate for many application. The ORE Model is closely aligned with the Atom data model and there are many clients and libraries capable of generating and manipulating Atom feeds. This format is described through an example below and in far greater detail in the user guide Resource Map Implementation in Atom and in the specification Representing Resource Maps Using the Atom Syndication Format. ORE Resource Maps are RDF Graphs and may thus be serialized with complete fidelity in any format capable of serializing RDF. RDF/XML is the recommended RDF serialization format and is described through an example below and in detail in Resource Map Implementation in RDF/XML. Any style of RDF/XML is permitted though there is guidance on picking a style for maximum interoperability. This serialization format may be appropriate in applications where there is a need to express many relationships that do not map to native Atom elements. RDFa allows an RDF Graph to be encoded within an (X)HTML document using a set of attributes on the (X)HTML elements. RDFa thus allows a Resource Map to be encoded within an (X)HTML "splash page" which provides a human-readable description of an Aggregation. RDFa serialization is described in detail in Resource Map Implementation in RDFa. Microformat approaches similar to RDFa are also possible but are not described here. The heart of the Atom Syndication Format is the notion of a feed, which aggregates a number of entries. The Atom feed corresponds to an ORE Aggregation and each Atom entry describes an Aggregated Resource. The Resource Map corresponds to an Atom feed document, the description of the feed or Aggregation. The example Atom feed document below is an Atom serialization of the Resource Map shown in the figure 4. This Resource Map describes a very simple Aggregation of three images on the OAI website. The Aggregation URI (A-1) is http://www.openarchives.org/ore/0.9/primer-examples/foo and is given by the /feed/id element. The Resource Map URI (ReM-1) is http://www.openarchives.org/ore/0.9/primer-examples/foo.atom and is given by the href attribute of the /feed/link element with rel="self" and type="application/atom+xml". Certain feed level elements are reserved for Resource Map metadata and the example includes the /feed/generator and /feed/updated elements, which map from dcterms:creator and dcterms:modified relations in the Model respectively. Most other feed level elements correspond with properties of the Aggregation. The example shows the /feed/category and /feed/link elements, which map from rdf:type and ore:similarTo relations respectively. There are also empty /feed/title and /feed/author elements because they are necessary to create a valid Atom feed document but were not specified in this very simple example. Each Atom entry describes an Aggregated Resource as indicated in the comments. The URI of each Aggregated Resource is indicated in the /feed/entry/link element with rel="alternate". The identities of the entries themselves, given in the /feed/entry/id elements, correspond to the URIs of Proxies for Aggregated Resources in the ORE Model [Data Model]. The values in the example are constructed to use the ORE Proxy URI resolver described in [ORE HTTP Implementation]. Proxies are necessary in the Atom serialization format and provide a means to refer to the Aggregated Resources in the context of the Aggregation. We do not describe them further in this document. The first Aggregated Resource is related to an external resource with the dcterms:hasFormat predicate. This predicate has no corresponding Atom element so the information is included as RDF in the rdf:Description element. The second Aggregated Resource has no additional relationships and is thus a minimal Atom entry. The third Aggregated Resource is typed foaf:Image and this relation is given in the /feed/entry/category element. Each Atom entry must have a /feed/entry/updated element but this has no correspondence in the model. The values should indicate the last modification time of the Atom entry. If this information is not available then the last modification time for the Resource Map (as given in /feed/updated) should be copied. Similarly to the feed, empty /feed/entry/title and /feed/entry/author elements are included because they are necessary to create a valid Atom feed document but were not specified in this very simple example. A rather more useful Resource Map including this descriptive metadata is available at http://www.openarchives.org/ore/0.9/primer-examples/foo2.atom. Atom serialization is described in more detail in Resource Map Implementation in Atom, which follows the profile specified in Representing Resource Maps Using the Atom Syndication Format. There are some properties of the Atom Syndication Format that have no correspondence in the ORE Data Model. Most of these have a mapping to RDF vocabularies defined in [ORE Atom] and will thus survive round-trip conversion between Atom and RDF serializations. The following example is an RDF/XML serialization of the Resource Map shown in figure 4 and shown serialized in Atom above. The RDF/XML syntax permits the encoding of a single feature in multiple ways in XML. The example follows the recommendations of Resource Map Implementation in RDF/XML. Each rdf:Description node element contains child property elements but those property elements do not contain further node elements. This is possible because there are no bnodes in this example; if there were then a second level of containment would be necessary. This is referred to as one level of "striping". The example above matches figure 4 and does not include the proxy nodes introduced in the Atom serialization example. An extended RDF/XML serialization corresponding to the Atom example is available here (and NTriples via Triplr). A further extended example with additional descriptive metadata is available here (and NTriples via Triplr). HTTP is the dominant protocol of the current Web and is the recommended protocol and associated URI scheme for ORE Aggregations and Resource Maps. The key model requirement is that dereference of an Aggregation URI must lead a client to a Resource Map describing the Aggregation. This is means that an Aggregation URI can be cited and then followed, and provides a mechanism for establishing that a Resource Map provides an authoritative description of the Aggregation. This syntactic trick allows the creation of an Aggregation URI A-1 that correctly yields the corresponding Resource Map without the need for an additional infrastructure beyond a web server to return the Resource Map from URI ReM-1. These implementation strategies are discussed in detail, along with possible migration strategies and the implementation of Proxy URIs, in the HTTP Implementation and Multiple Serializations user guide. Batch Discovery - in either a repository context where many local Resource Maps are known, or in the case of an aggregator which has details of Resource Maps provided on other servers, it may be appropriate to allow bulk harvesting of Resource Maps or locations. This may be achieved via OAI-PMH, SiteMaps, RSS or Atom feeds. indicates the HTML page is associated with an Aggregation described by a Resource Map http://example.org/foo.atom. The inclusion of the alternate relation allows browsers to detect the availability of the associated Atom feed. might be included in the HTTP response with JPEG image to indicate that the resource is in the Aggregation described by a Resource Map http://example.org/foo.atom. Notions of trust are notoriously complex, hard to establish, and yet essential for many applications. The ORE specifications are based on Web and Semantic Web standards which provide authority rules as a scaffolding to allow applications to establish trust. In particular, the ORE Model uses RDF which allows anyone to say anything about anything although understanding who or what is doing the saying may help one establish trust (or not). This section outlines elements of authority determination that may be used with Resource Maps. Imagine being given the URI of an Aggregation. How can one find an authoritative Resource Map describing that Aggregation? The Web Architecture depends upon the URI owner to provide authoritative descriptions of the resource identified by the URI (see URI allocation [Web Architecture], [Linked Data Tutorial]. The ORE specifications follow this notion. It is expected that an attempt to dereference the URI of an Aggregation will lead (via one of the mechanisms described above) to an authoritative Resource Map. A Resource Map obtained via the Aggregation URI is thus considered an authoritative description of the Aggregation [ORE Date Model]. The mechanisms provided to lead from an Aggregation to a Resource Map describing it, in combination with other discovery mechanisms, allow clients and agents to follow their noses to and from authoritative descriptions. Non-authoritative descriptions may also be useful but do not form part of this follow you nose Web. Named graphs, provenance and trust , J. Carroll, C. Bizer, P. Hayes, P. Stickler, Proceedings of the 14th international conference on World Wide Web, 2005. Available at http://portal.acm.org/citation.cfm?id=1060835 . RDF Vocabulary Description Language 1.0: RDF Schema , Dan Brickley and R.V. Guha, (editors), W3C Recommendation, 10 February 2004, http://www.w3.org/TR/2004/REC-rdf-schema-20040210/ .